It's been just about two years since we reviewed eero, the first mesh/distributed Wi-Fi System to ship. This once bright and shiny Wi-Fi market segment is old news now, with plenty of competition, some company exits and eroding margins as discounting becomes more common. So anyone coming to market with a Wi-Fi System at this point needs to bring something good to the party attract buyers. 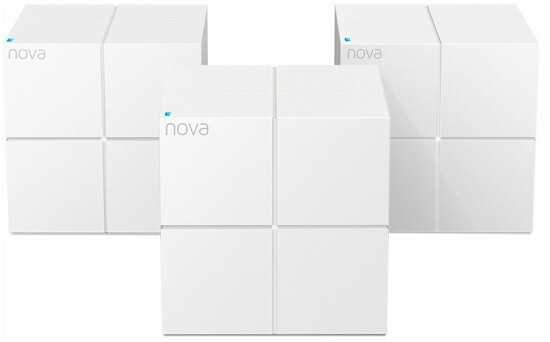 Enter the three-node Tenda MW6 Nova Whole Home Mesh WiFi System. Tenda's usual marketshare-grabbing weapon of choice is price and the Nova is no diferent. Nova has typically sold on Amazon for around $200, but is now down to $130 (!) as I write this. Nova is not your typical Qualcomm-based three-pack mesh system, because it uses Realtek chipsets. And while it's set up and managed via iOS or Android apps, it relies on Wi-Fi, not Bluetooth to make the intial setup connection. All three 3" cubes in the kit are the same, with two Gigabit Ethernet ports and a single power port. Each contains a two-stream dual-band AC1200 class radio supporting maximum link rates of 300 and 867 Mbps for 2.4 and 5 GHz, respectively. In case you care, Nova also supports MU-MIMO, which delivers little benefit in general and even less in a two-stream design. There's a single LED at the top of each cube that glows steady blue when each node is happy and uses the other colors shown below from the installation guide for other states. Tenda released the FCC ID photos, which were used to identify most of the main components The first photo is the view with the bottom cover removed, showing heatsinks and antenna connections. The two Ethernet ports sit on a small rider board that attaches to the main board via a connector. The next photo shows the board removed from the case with connector board, heatsinks and RF can tops removed. It's not clear enough for component ID, but the FCC file has component close-ups that were. The bottom of the board is normally covered with a heatsink plate with raised areas that connect to the gridded areas via thermal pads for additional heat transfer. The table compares Nova's key components against TP-Link's Deco M5, which looks to be Nova's main price competitor. Since I have no way to get accurate pricing on components, I can't say whether Deco's single Qualcomm SoC design is cheaper to build than Nova's two SoCs. What I can say is that Nova's design is, according to WikiDevi, essentially the same used in Tenda's AC10 and AC10U routers. Note that the 128 MB of RAM is embedded in the RTL8197FS and there is no Bluetooth radio, as previously mentioned.